We finally made it out to Frazier Mills and it was well worth the wait. We went the Thursday before Labor Day weekend and we stayed till Saturday, hoping to beat some of the holiday crowds. To our surprise, on Thursday night only 3 or 4 out of the 46 sites were occupied. The campground is spread out so we really felt alone. It was one of those rare quiet nights, the only sound was coming from the small nearby creek. So rarely we do experience quietness on this level that it was a little jarring, a little unsettling. But it was so lovely at the same time. Not only was it quiet but it was pitch black dark because the thick Sequoia canopy, we felt hemmed in by the thick darkness that surrounded our fire. Friday night was a different story, a lot of people showed up, and a few really loved their music and wanted to share it with the rest of the campground late into the night. 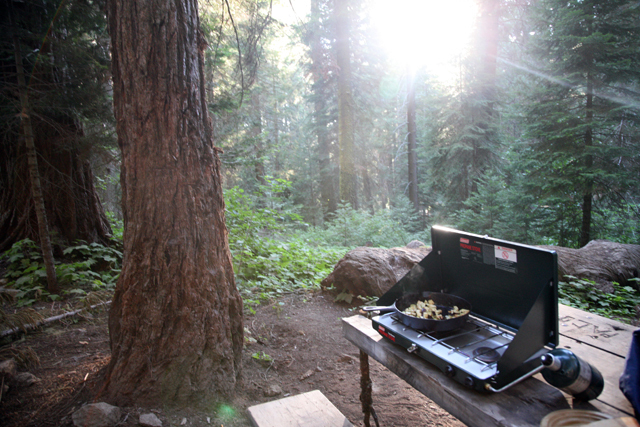 We have learned that camping in busy spots, or on busy weekends, usually means we're going to enjoy the beat of music to our fire. (We really DON'T understand what posses a person to play LOUD music while camping?!?!) Luckily, the site we picked didn't have any close neighbors, so even though we could hear the people across the creek we couldn't see anyone and we still felt secluded. Unfortunately we were "hearing" them well past 2am! Such bad camping etiquette..
Back in June when we were first trying to make it out this way we read that all campgrounds in Mountain Home Demonstration State Forest were free to the public. 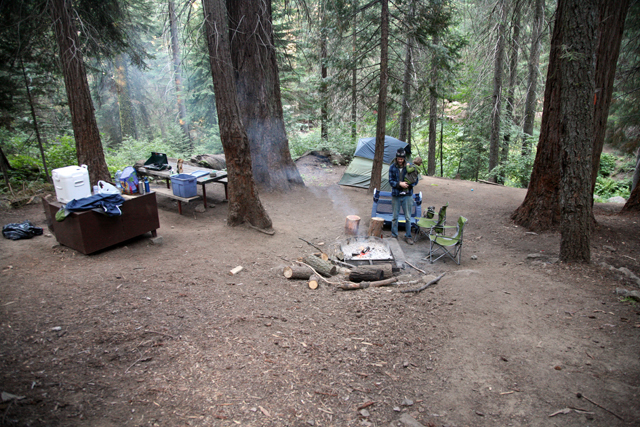 But as of August 1, 2011 there is a $15 fee to camp at all the campgrounds. At first we were bummed about the fee, but in talking with the camp host at Frazier Mills it might be a good thing after all. The camp host, who has been camping at Frazier Mills since the 60's, said that the place was becoming a spot where people knew they could party all night because no fee meant that there was no one patrolling the campground. 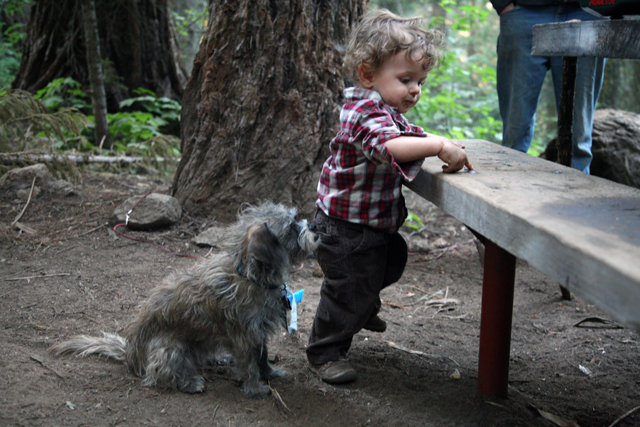 With a little more regulation the campground is less of a "free for all" - which is good for us, a camping family. The camp host, Dave, is really a friendly guy. He knows tons about the forest and the area, and he even gave us a map of the area which was really helpful. He told us about a spring that had really good water and, I kid you not, it is the best water we have ever tasted. And on top of that great piece of knowledge he told us where to pick wild blackberries - a magical experience to say the least. This is Greg, one of our neighbors on Thursday night. He is part of a nomadic religious family who strives to promote peace and love between humanity, the environment and God. It was a treat meeting him. Everyone we met here was really friendly and the majority of people we met had been coming here for years, even decades. Since learning about Mountain Home Demonstration State Forest I have asked people if they've heard about it, and no one has! 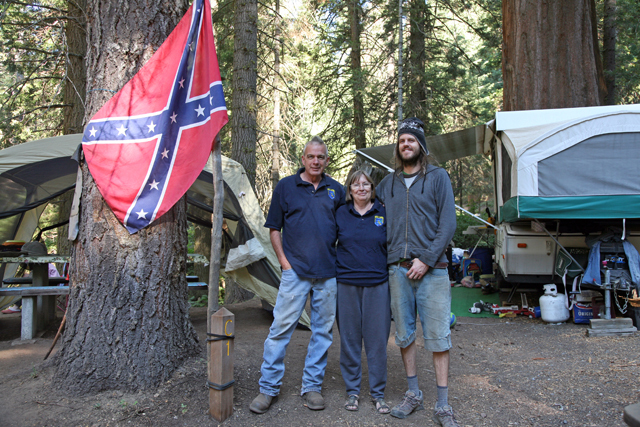 And by talking to people who have been coming for years it seems to have been over looked by the crowds, who are drawn just north to Sequoia and Kings Canyon National parks. 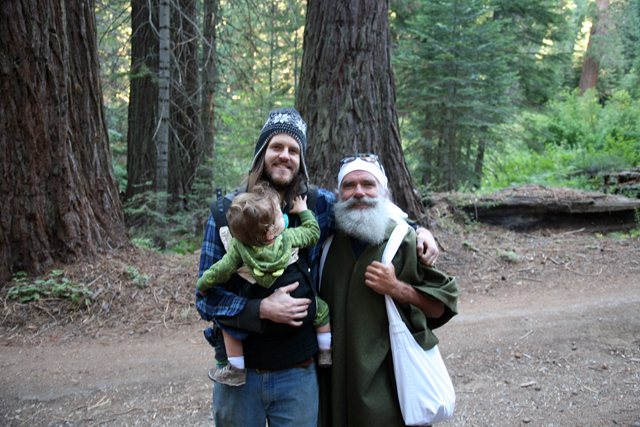 The people we met on this trip were really great people. The campground has a real friendly vibe, even when it got busier everyone stilled waved and said "hi" and it was real easy to start a conversation with fellow campers. 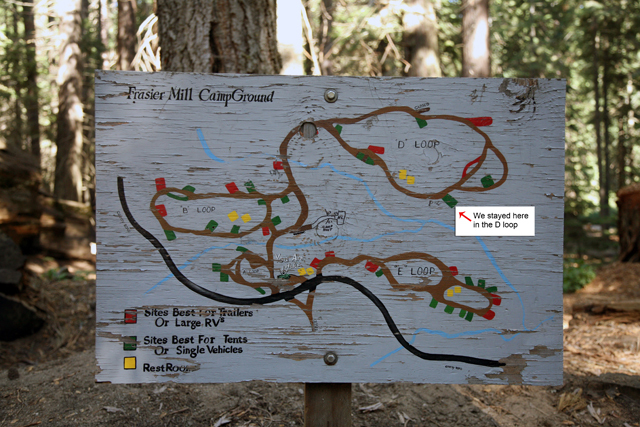 The campground itself is broken up into three loops. The "E" loop is the loudest and most crowded loop. The "D" loop has the best campsite separation. And the "B" loop has some great sites, but definitely not as secluded as the "D" loop. We stayed in the "D" loop and found a really nice spot right on the creek with no other sites near by, perfect for little JW who can get a little loud in the middle of the night. 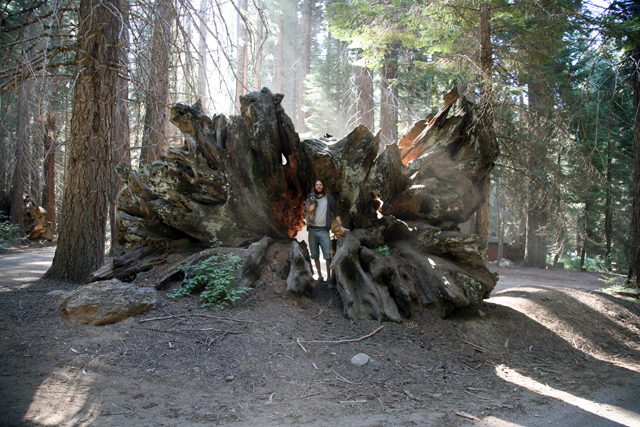 The campground is scatted with Giant Sequoias, with just as many huge fallen giant stumps. 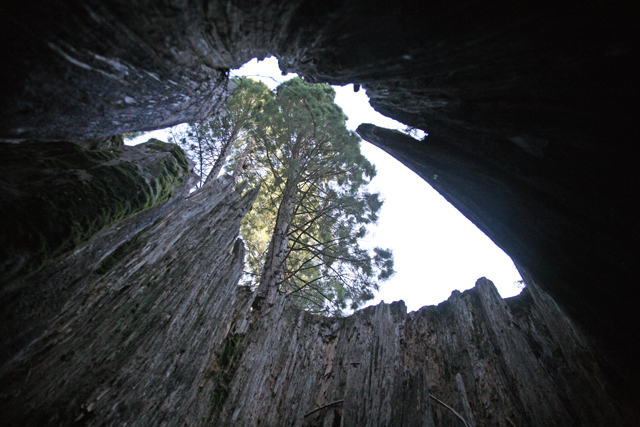 Some of the best Sequoia viewing is right there in the campground. 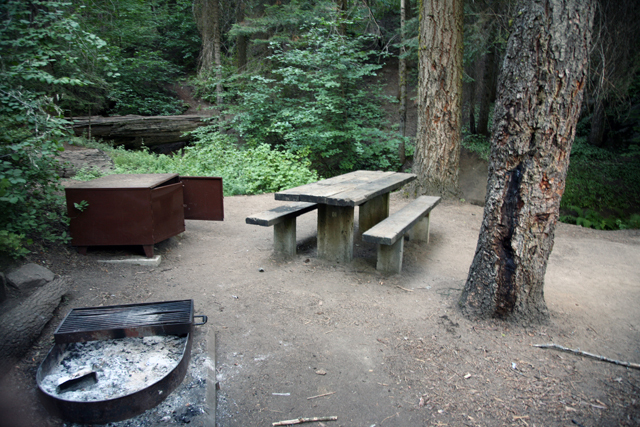 One of those trees IN the campground is the Nero Tree (below). 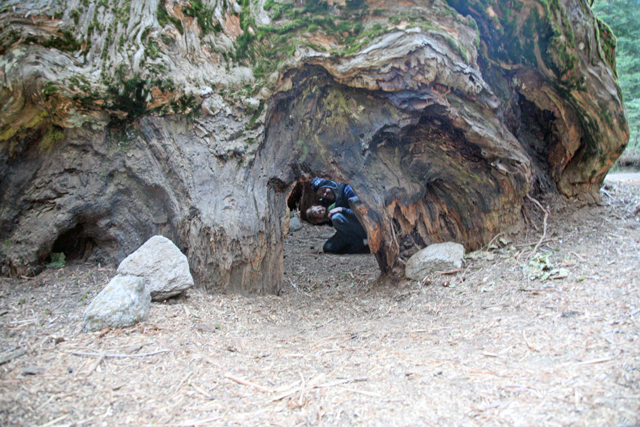 It's a hollowed out HUGE stump that you can crawl into. There is a lot to do in the area , but didn't do everything while we were there, so we are excited to return and explore some more! We've truly found a gem! Our site, D6, looking up from the creek. Dirty, dirty JW. He had a dirt mustache and dirt in his eyebrows. These days he isn't liking the confines of his pack and play. He prefers to get out and crawl around in the dirt. I think we are going to have to start bringing a bath tub. 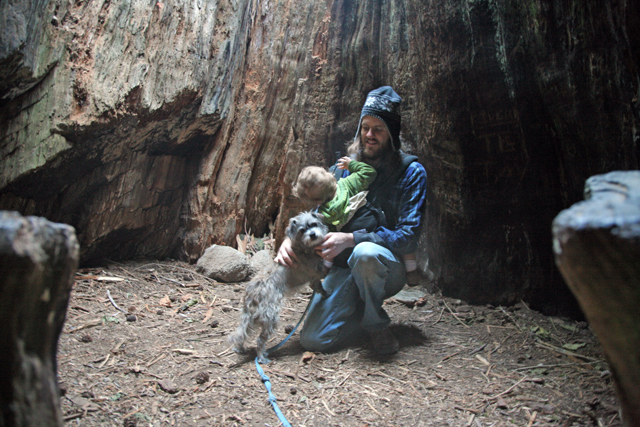 JW and Justin inside the Nero stump. You have to crawl through that hole to get it! 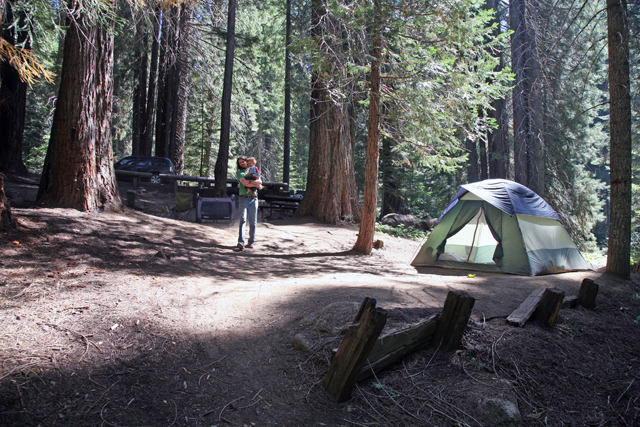 A great shot of our campsite, it had a pretty mean slope but the sleeping area was perfectly flat. No neighbors within sight! It's about 22 miles till you get to the campground.